How to Keep Away Beavers - In North America beavers are considered to be the largest rodent. They feed off of branches, plants and leaves. While they live in watery areas, they travel to many crop areas to gather food. They have been known to also use food that they don’t eat to build their homes. They will chomp away at the trees in your yard as well as the vegetation and as they do this, their food will grow even quicker giving them an unlimited supply of food to store. Homeowners are caused much havoc due to the dams that beavers build which cause the flow of our streams, lakes and rivers to change. This can result in flooded roads and yards destroying the crops that gardeners have worked so hard to grow. Not to mention, they can carry diseases. However, having a beaver around is not all bad. It’s important to understand that even though beavers can be a nuisance sometimes, they are actually beneficial for our health. The secretion of female and male beavers is used in medicine for back pain relief, contraception and as an anti-inflammatory agent. It was also used in people with hysteria and dysmenorrheal. It has been proven that they can improve the flow of water due to their building dams. 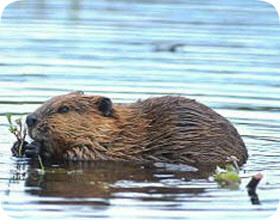 If you have a pond or lake on your property, you’ve probably noticed some beaver dams. Traps are the most effective way to remove and relocate them to other areas. However, traps can be very expensive and you really have to know what you’re doing to remove them. There are also a variety of different traps that you can use, but it’s always recommended that you use traps that will not harm the beavers or other animals that may cross its path. These traps are similar to cages that snap shut once a beaver has been caught inside. The beaver will more than likely be lured in with poplar bark, which they absolutely love the smell of. These cages normally have a trigger where the bark will sit that shuts the cage door once the beaver has fallen for the bait. For the best results, consider consulting with a professional on using this method to get rid of beavers for you. There are a number of beaver repellants that you can put on your trees to keep beavers from chomping at them. Unfortunately, these are not a good option because they wear off quickly and require that you continuously reapply them. Buying this overtime can really begin to put a dent in your pocket. Besides, the beaver will just return after becoming immune to the scent. If you really want to keep beavers from doing damage to your trees, metal mesh fencing is not a bad idea at all. Your beaver friends can chew on this fence all they want in hopes of getting in, but they will not succeed on making it in your yard. Sometimes these fences are soaked in chemicals that are not harmful, but after the beaver gets a taste of it, they won’t want to make a repeat performance. Because of this, your trees are saved from being cut down. The beavers may not leave completely, but they won’t be able to get to your trees. You can choose to fence in as many trees as you like in your yard. However, if you want them to look elsewhere for food, you will need to wrap all of the trees on your property. These fences can last for many years, which means that in the end, you save more money. The fence that you choose can be hardware cloth or welded wire. It should at least be about 3 feet high and 3-4 inches from the base of the tree or plants. This will give the trees and plants enough room to continue growing if applicable. Sometimes you may come across beavers that are very aggressive at getting their food. In this case, you’d want to bury the fencing much deeper and use metal pins to keep it in place and the seams can be held together with plastic ties. Go back to the main Beaver Removal page for more information about beaver prevention, and more information about how to keep beavers away.